WILDFIRES: Fire danger ratings in the Rockies are very high and trail closures and campfire bans are in effect. Wildfire smoke is occurring along much of the GDT and is causing poor air quality and reduced visibility. Read wildfire updates regularly and be cautious out there. SECTION A TRAIL CLOSURES: Due to extreme fire hazard in Waterton Lake National Park, the GDT is closed from Rowe Meadow (a10) to the Blakiston Valley trail junction, and the Sage Pass Trail is also closed (a16 to a17). No detour is available at this time. SECTION A CAMPGROUND CLOSURES: All backcountry campgrounds in Waterton Lake National Park and Akamina Kishinena Provincial Park are closed due to extreme fire hazard. SECTION C TRAIL CLOSURES: Mount Assiniboine Provincial Park, Banff National Park and Kootenay National Park have partial closures due to the due to the Verdant Creek Wildfire. The GDT is closed from Og Lake (c11) to Citadel Pass (c13), and from Ball Pass Junction (c21) to Hawk Creek trailhead (c23). Detour around these closures is difficult but can be done by leaving the GDT at Watridge Lake trail junction (c7) or Allenby Pass junction (on the Assiniboine Pass alternate) and rejoin the GDT at the Floe Lake trailhead (c23). 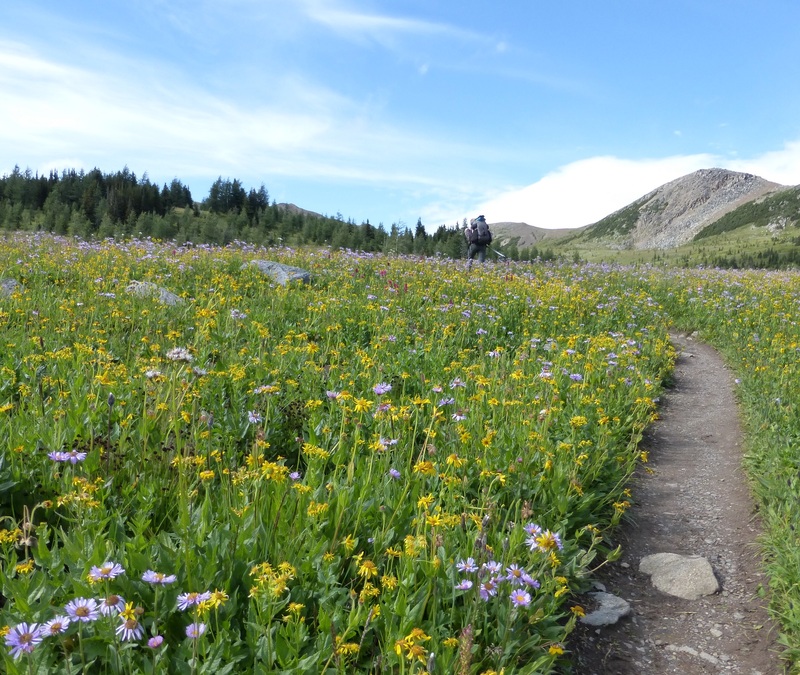 The GDT is open around Sunshine Village and Egypt Lake but cannot be hiked contiguously due to the closures north and south of Sunshine Village. CAMPFIRE BANS: Given the extremely high fire hazard, campfires are not recommended anywhere on the GDT until further notice. A campfire ban is in effect in all of BC, which includes all sections of the GDT in BC from Akamina Pass to Kakwa Lake. These prohibitions do not apply to cooking stoves that use gas or propane. Due to the high fire hazard, backcountry and front country campfire bans are in effect in Banff, Jasper, Kootenay, Waterton Lakes and Yoho National Parks. A Fire Restriction and campfire ban has been issued for the Calgary Forest Area which includes all sections of the GDT in Alberta from Sage Pass to North Kananaskis Pass, due to high fire hazard. Gas or propane stoves are still allowed in campgrounds and random camping areas. BEARS: It’s berry season! Berry bushes border trails, roads and campgrounds on the GDT, and black and grizzly bears are feeding on berries right now. Be bear aware on the trails this summer, make noise and carry bear spray. Waterton Lakes National Park: Rowe Lake Trail is closed due to grizzly bears feeding in the area. Due to extreme fire hazard in Waterton Lake National Park, the GDT is closed from Rowe Meadow (a10) to the Blakiston Valley trail junction, and the Sage Pass Trail is also closed (a16 to a17). No detour is available at this time. All backcountry campgrounds in Waterton Lake National Park and Akamina Kishinena Provincial Park are closed due to extreme fire hazard. Mount Assiniboine Provincial Park, Banff National Park and Kootenay National Park have partial closures due to the due to the Verdant Creek Wildfire. The GDT is closed from Og Lake (c11) to Citadel Pass (c13), and from Ball Pass Junction (c21) to Hawk Creek trailhead (c23). Detour around these closures is difficult but can be done by leaving the GDT at Watridge Lake trail junction (c7) or Allenby Pass junction (on the Assiniboine Pass alternate) and rejoin the GDT at the Floe Lake trailhead (c23). The GDT is open around Sunshine Village and Egypt Lake but cannot be hiked contiguously due to the closures north and south of Sunshine Village. Due to extreme fire hazard, recreational use of off-road vehicles is prohibited on all Crown lands in southwest BC and southeast Alberta. A travel advisory is in effect for Highway 93 South from Castle Junction to Radium. Fire fighters will be working adjacent to the highway and reduced speed zones will be in place. Drivers should anticipate possible delays. Access to the northern terminus of the GDT in Kakwa Provincial Park is via the Walker Creek Forest Service Road. The Walker Creek FSR has been repaired from Highway 16 to km 33.5. While travelling the remaining 40 kilometres on the Walker Creek FSR, attention is required to navigate the surface as it is uneven, rutted, slippery and very rough. 4WD/AWD high clearance vehicle is recommended. The last 10km from Bastille Creek to Buchanan Creek is closed due to washouts and is not driveable by vehicle so be prepared to walk this distance on foot.